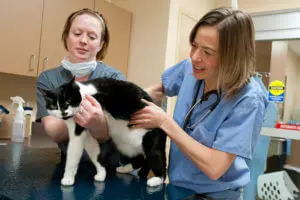 Our 24 hour pet hospital is in Waltham, 30 minutes west of Boston, and serves the greater Boston region, including Woburn, Burlington, Lexington, Bedford, Lincoln, Weston, Watertown, Auburndale and Newton. Our state-of-the-art Blue Pearl pet hospital in Waltham was founded in 2001 and is open 24 hours, seven days a week and 365 days a year. Turn to us for compassionate, multi-disciplinary care. If a pet emergency brings you to our 16,000-square-foot clinic, we stand ready with fully equipped central emergency stations, a blood bank, three surgical suites and four glass-enclosed intensive care units. One is especially for cats. There’s also an isolation ward. And, for special situations, there’s an enriched oxygen cage called a Snyder intensive care unit. Diagnostic capabilities include a CT scanner, laparoscopy, thoracoscopy, arthroscopy and ophthalmic ultrasound, among others. Our pet hospital in Waltham also has a Puritan Bennett 840 ventilator that manages and is responsive to all patients’ breathing from neonatal to adulthood. 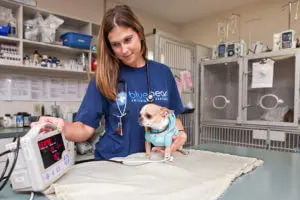 The Waltham pet hospital is also home to the New England Veterinary Oncology Group (NEVOG), a BluePearl veterinary partner. The veterinary specialists and support team at NEVOG provide oncology services for pets Monday – Friday. Contact them at nevogreception@bluepearlvet.com or 781.684.8688.